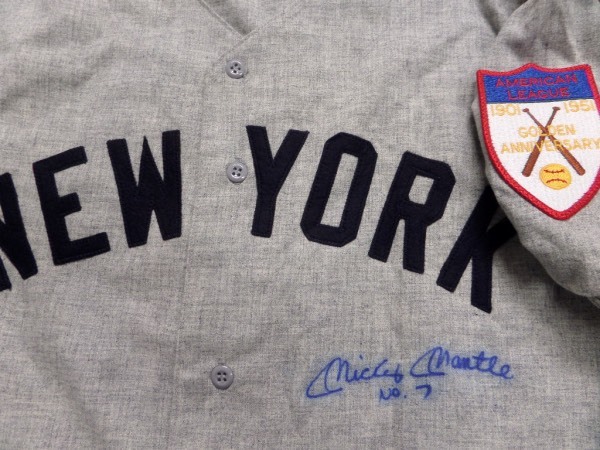 Coach's Corner - Mickey Mantle autographed vintage throwback 1951 Yanks jersey! Go Back to Lot List Mickey Mantle autographed vintage throwback 1951 Yanks jersey! This gray mens large gray Yanks jersey is an authentic-style throwback complete with sewn on everything including the 1951 Golden Anniversary patch for the AL! It is in mint shape and comes signed on the front by the Mick in blue with NO.7 included. Very minor "bleeding" on the signature due to aging, but still shows off superbly and ideal for framing and retails into the low thousands.